Amelia Forsbrook discovers a religious revolutionary with a choir boy’s sweetness. Clive Bayley, Anthony Roth Costanzo, James Cleverton and Colin Judson in Akhnaten. Photo: Richard Hubert Smith. There’s a contemporary thrust to Philip Glass’s Akhnaten that makes this opera appear a lot younger than its 31 years – but there’s also a certain timelessness that makes it sound like its layers of ostinati have been in motion since 1353 BC, when our titular character began his reign. Characteristically for Glass, there’s a lot of opposition at play here: the opera’s sturdy minimalism, which at times brings a certain rhythm of universality and truth, is artfully undermined by a humorous undercurrent that doubts whether we can really capture the past – and so this final offering from Glass’s trilogy of Portrait operas shows the composer has a knack for creating contemporary works that travel through time, while tripping us up at every corner. While Glass cites the thinker at the centre of his first ‘Portrait’, 1976’s Einstein on the Beach, as “the man of science”, the Gandhi of 1980’s Satyagraha as “the man of politics”, and Akhnaten as our “man of religion”, the composer maintains that these definitions are fluid. Here, when Akhnaten becomes Pharaoh, these flexible borders are crossed over and over again. Akhnaten’s interests are largely spiritual. Guided by the sun and the singular God who makes it rise, Akhnaten seeks to abolish Egypt’s monotheistic outlook in favour of one scorcher of a deity. But as he risks rejection for this controversial move, and risks isolation for his liberal take on gender fluidity, this is as much a political narrative as it is a spiritual one. Indeed, Glass’s interest may have been piqued by how the figure of Akhnaten provided the blueprint for the Oedipus myth, but this tragic downfall lies in a punishment that is administered by mortals, not Gods. Countertenor Anthony Roth Costanzo is breathtaking as the tragic hero, his presence on the stage suggesting a leader at the mercy of a power thoroughly out of his control. Sometimes naked, at other points dressed in translucent robes, sometimes with a muscular chest, sometimes with breasts, he melts across the stage, following pathways formed by scenery that is in constant flux. Under Phelim McDermott’s direction, Costanzo moves like an automation blindly following its destiny. When he finally sings, it comes as a surprise: until this point, his presence has been so elegantly shaped by others, who hatch him from one outfit and dress him in another, posing him, spinning him and coaxing him from one corner of the stage to the other. It’s alarming to hear him speaking for himself. On top of this, Costanzo’s voice is so shrill and otherworldly. Taking the range where male and female voices meet, this Akhnaten is a religious revolutionary with a choir boy’s sweetness. It’s almost grating, but rests at a point that is rare, beautiful, queerly suggestive and deeply alluring. In a biography that is, at once, stripped down and extravagant, Akhnaten’s short reign is bookended by rituals that bring an undoubtable circularity to the opera and undermine any changes made throughout his time as Pharaoh. The reliance on original scripts in Egyptian, Hebrew and Akkadian – a rare move for a company that prides itself on its English language operas – supplemented with a contemporary lecture scene that stresses the impenetrability of ancient history, works to ultimately shroud and mystify the central character. 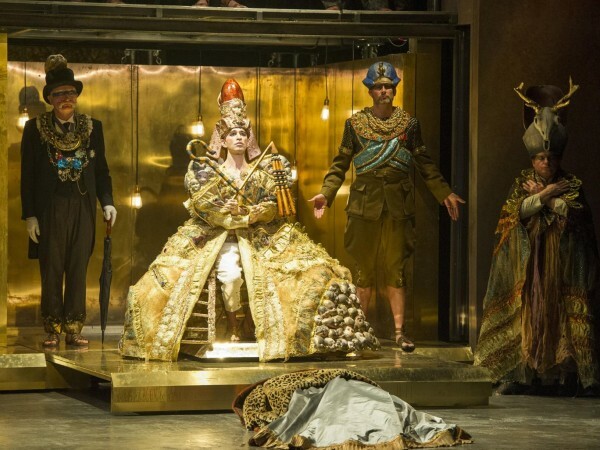 Optical illusion plays a strong part: the use of corrugated glass clouds some of the most significant action, Kevin Pollard’s playful costume design leaves us doubting Akhnaten’s gender, while the heavily jewelled and made-up cast bring a certain anachronistic sexuality to the stage. Adding to this thread of spectacle, the mighty chorus occasionally risk derailing the centre of this tale, so captivating, full and rich is their presence. Throughout, a troupe of jugglers bring yet more turbulence to the narrative, wearing masks that mock Akhnaten’s monotheistic worldview as they use their props to challenge the astrological patterns their ruler holds in such high esteem. As light in action as it is heavy in detail, the staging of Akhnaten progresses with a tempo that, at times, seems proudly reluctant to be confined by Glass’s score. For the most part, though, supported by a creative team that is so indebted to the iconography of ancient Egypt that it puts the gift shop at Birmingham Museum and Art Gallery to shame, McDermott serves up a deliciously visual tragedy that is a fit and meditative match for the repetitive, circular details of Glass’s pendular score. There’s a muscular urgency to the tribal drums that pound through the Funeral of Amenhotep III, and the horns sounding from the pit seem to be constantly announcing an unspoken tragedy. Visualising this energy, Tom Pye’s metallic set is angular and labour-intensive, drawing on muted Egyptian symbology and papyrus storytelling at every opportunity. With its heavy wheels and panels that require constant manual energy from cast and chorus, Pye’s world, like Akhnaten’s, is one where change comes at a definite price. Akhnaten is on at the London Coliseum until 18th March 2016. Click here for tickets.